Hello, my sweet friends – today is the day! Today is the day that I’m starting a brand new series called “The Best Of Worthing Court”. Once each week, I’ll be sharing something out of Worthing Court’s archives. I hope that my new(er) readers will enjoy some of my projects and inspiration that they may not have seen before. And for my longtime friends, I hope you’ll enjoy it all over again! The “season of love” is right around the corner – Valentine’s Day, that is. I don’t do a huge amount of decorating in my home for the famous holiday of love, but I do like to add a few simple touches here and there. For that very reason, I’m always trying to come up with ways to give a nod to the holiday without spending a lot of money or doing anything that is too time consuming. 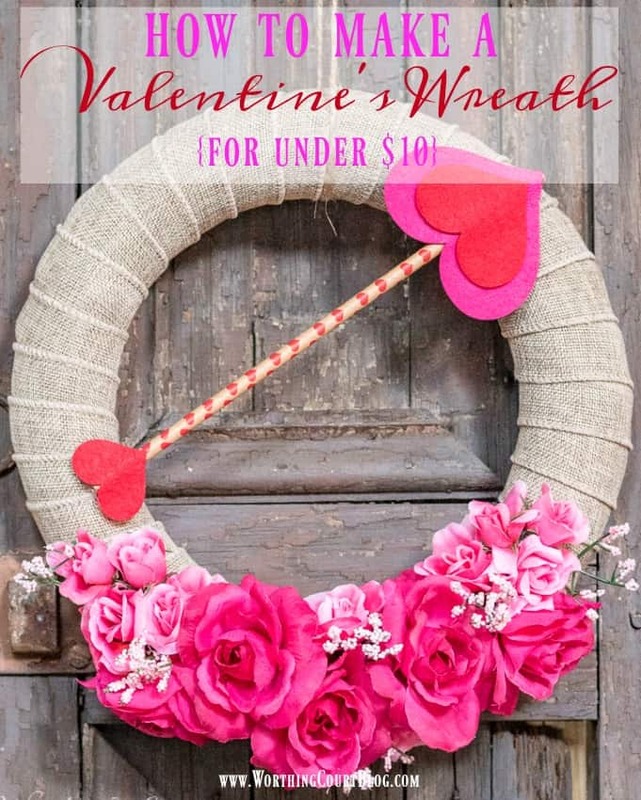 This wreath will be a great addition to my small stash of Valentine’s Day decorations. Plus, it isn’t huge, so I’ll be able to tuck it in just about any place that I add Valentine’s touches to. A quick trip to the store provided everything that I needed. I have a total of $9 invested in my supplies, but I actually wound up only using $7 worth. Everything that you see here came from the dollar store, except for the straws, which came from the dollar spot at Target. 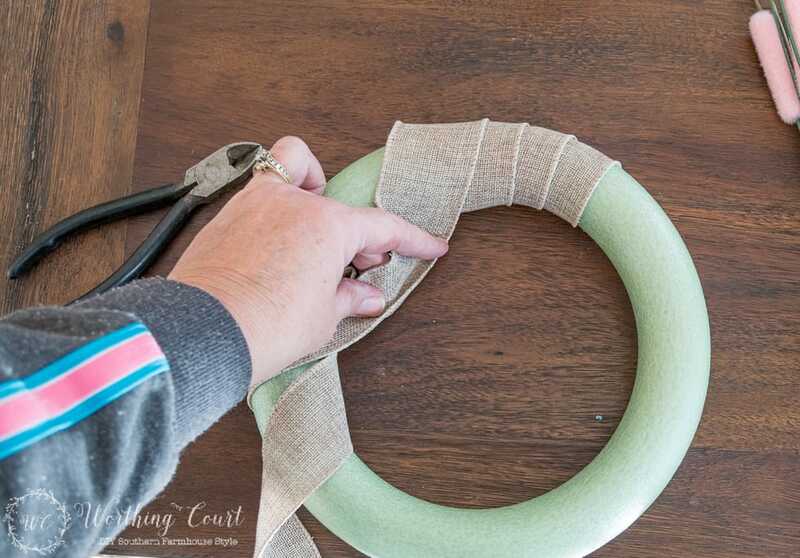 The first step is to wrap the wreath form with burlap ribbon. The above photo shows three rolls of ribbon, but I only used two. I started the ribbon by running a small bead of hot glue on the back of the wreath to hold the end of the ribbon in place. The next step is to prep the flowers for attaching to the wreath. 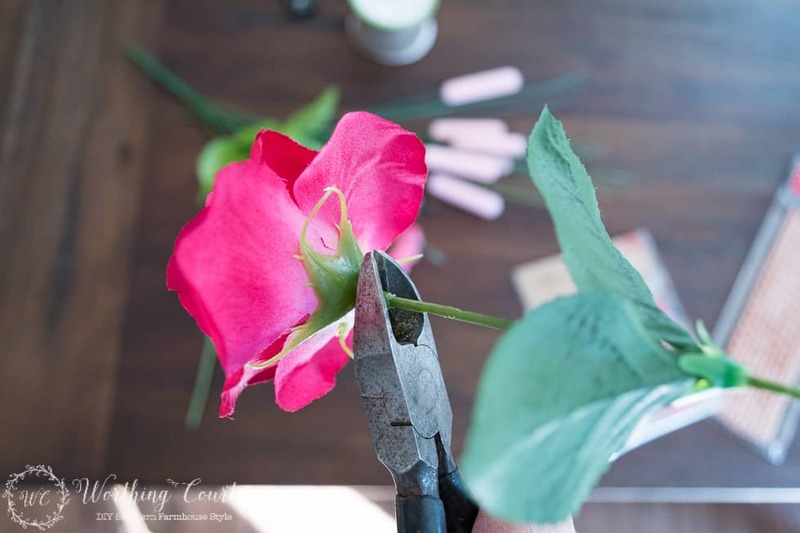 Using wire snips, I snipped the stem from the back of each flower. Be careful not to snip too closely though, or your flower will fall apart. This is what you want to wind up with. Once all of the stems have been snipped from the flowers, just hot glue them to your wreath in an arrangement that’s pleasing to you. I glued the larger flowers first and then filled in with the smaller pink ones. Now to make the oh-so-simple arrow. 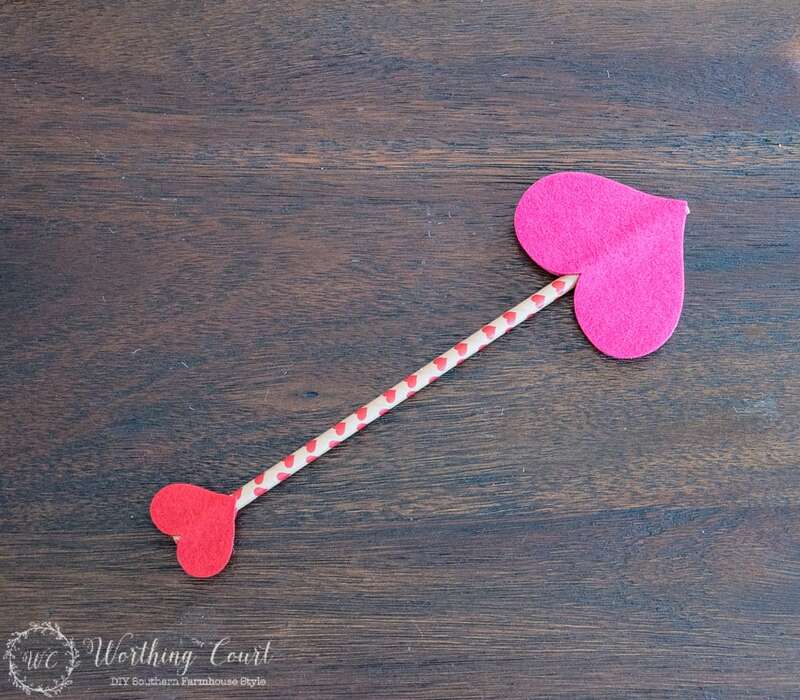 The felt hearts are stickers, so all I did was to place one on the straw in the position that I wanted it and then stick the matching heart to the back of it, with the straw between the two layers. Position the heart where you want it to be and attach it with a couple of spots of hot glue. You’re done! It looks super cute hanging with just a piece of jute twine! How about you, do you do any decorating at all for Valentine’s Day? Do you go all out or just sprinkle a little love here and there around your home? Sharing at THESE great parties!. Love this wreath – thanks for sharing. Too cute and oh so simple —– not to mention the low low cost . Ill be stopping by the $ tree today . Love it!! 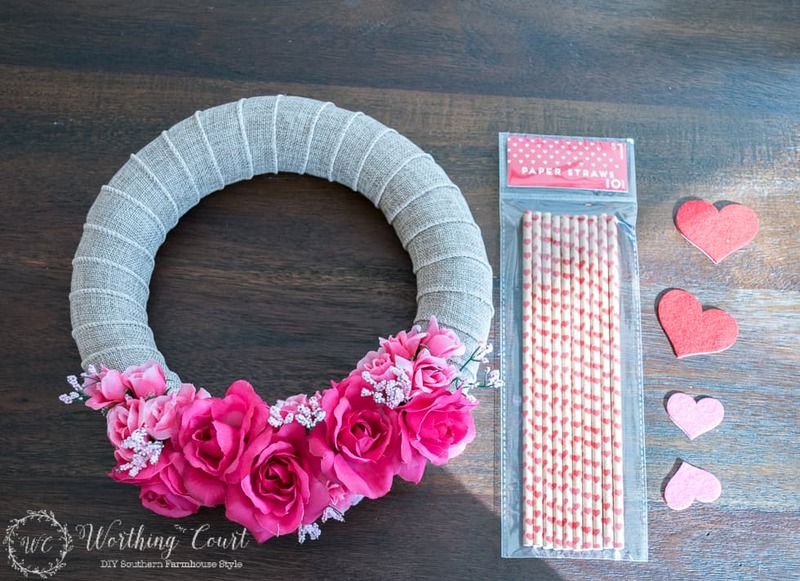 Such a great idea for a Valentine’s Day Wreath! I’m also gonna use that burlap base wreath for other holidays & seasons!! Thanks so much for the idea!! Suzy, it is beautiful! What a great way to decorate for Valentine’s Day without spending a small fortune. Love how you made the arrow. So creative! Enjoy the rest of your week and thank you for the inspiration. How adorable. 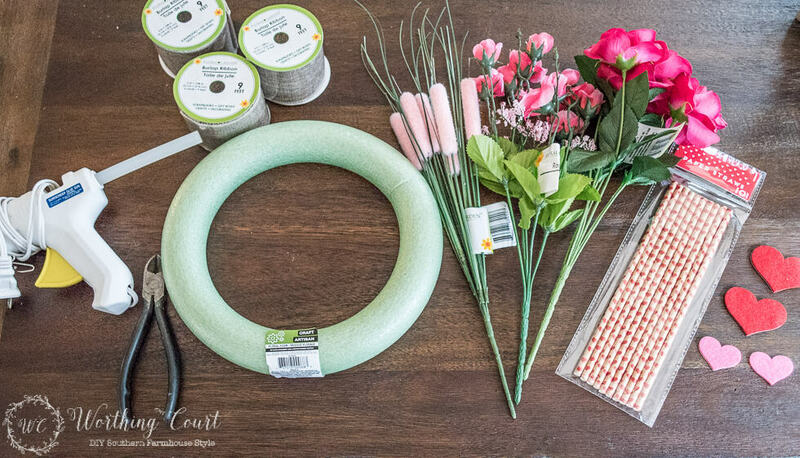 Just a few items to pick up and I am going to make this wreath this weekend. Cute wreath! 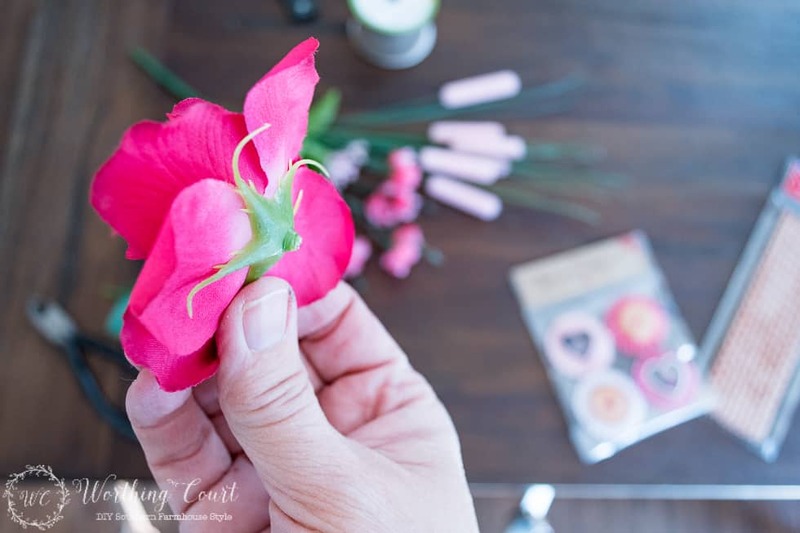 I love that it looks easy to make and very inexpensive! $ Store, here I come! 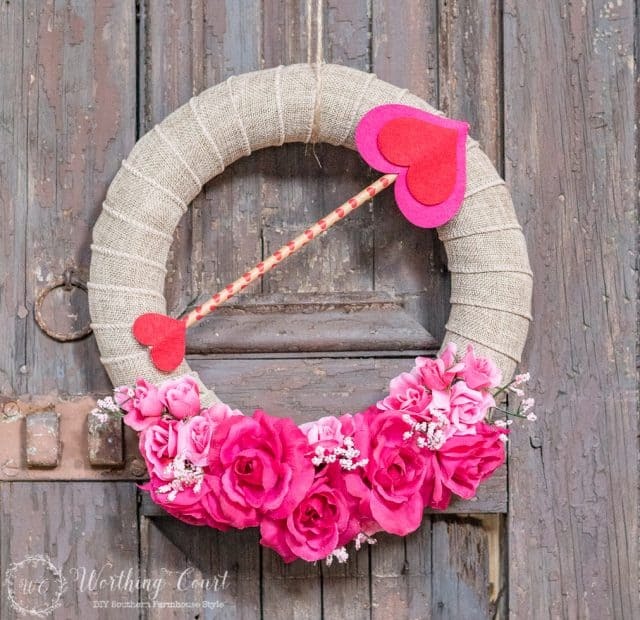 I don’t decorate the house for Valentines, but I do put a wreath on the door~ now I have a new cute and easy choice to make! I too like to add some pink and red touch throughout the house, it’s fun!! Cute :)…can’t wait to see what else you pull from the archives! Very cute! 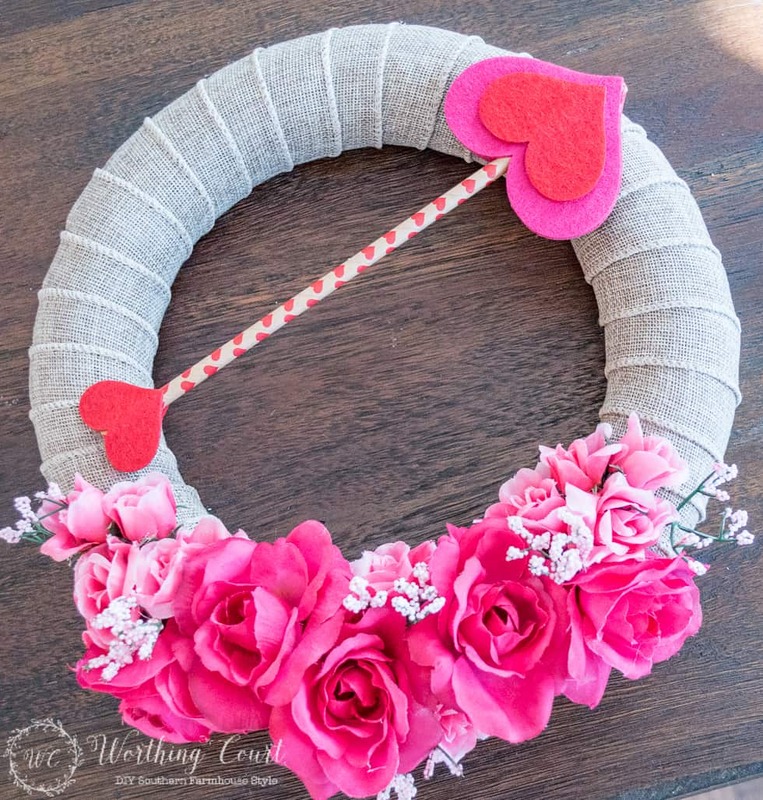 I love your Valentine’s wreath. This is really cute Suzie! Love this idea, adorable and classy at the same time? Cute!! An easy decoration for Valentines Day. 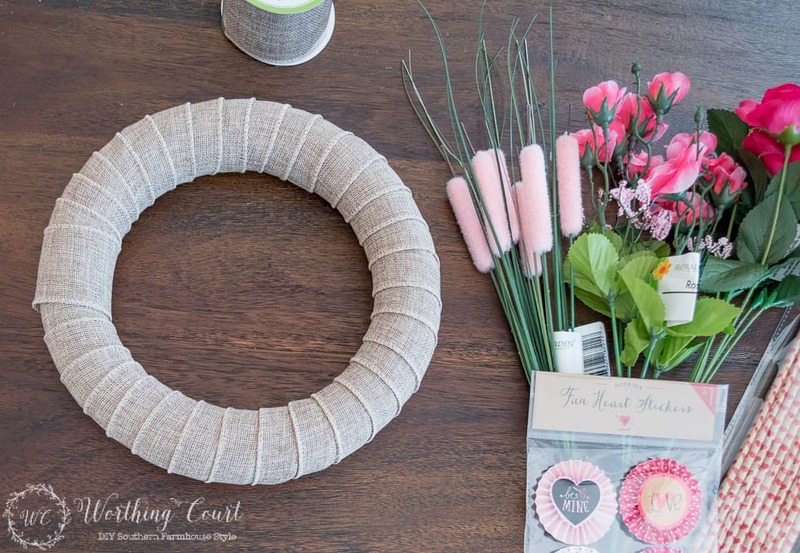 This wreath is very pretty, and the step-by-step directions make it so easy. I’d love to try it!